So you're nosing around near water in the North American Northeast, and you see a frog that's green. Is it a green frog? That depends on what you mean. Green frog could mean nothing more or less than a frog whose color is green. Or it could mean a species of frog, the green frog, Lithobates clamitans, which may not be the only green frog in the neighborhood. Let's consider the green frog, Lithobates clamitans, first. See the photo of one below. As you can see, it has some dark speckling on the torso and a crease running down the side of its back. (It has another crease on the far side of the back that doesn't show in this photo.) These are good indications this is a green frog. To clinch the i.d., note the dark bars crossing the hind legs. Green frogs have these. 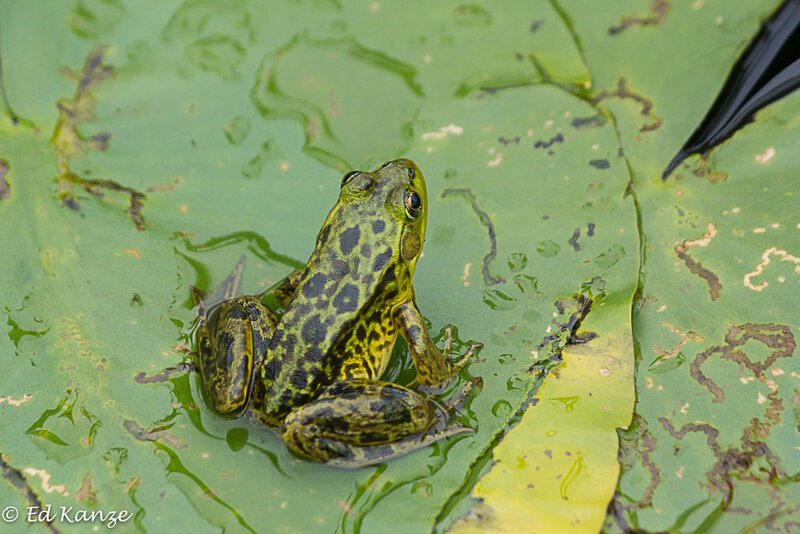 The other two green-colored frogs we'll be talking about, the bullfrog (Lithobates catesbeiana) and the mink frog (Lithobates septentrionalis) do not. When a male green frog speaks, it utters a sound something like the plucking of a banjo string. The frog in the first photo is a green frog, too. Look carefully, and you'll see the creases running down its back. Now let's consider the bullfrog. This biggest of our northeastern frogs is known to eat, at least on occasion, not only insects but birds, rodents, snakes, and other frogs. Let's take a look at one. Note that the bullfrog is mostly all green, with some dark spotting on the legs but no crossways barring on the hind legs. The creases we saw on the green frog are missing. 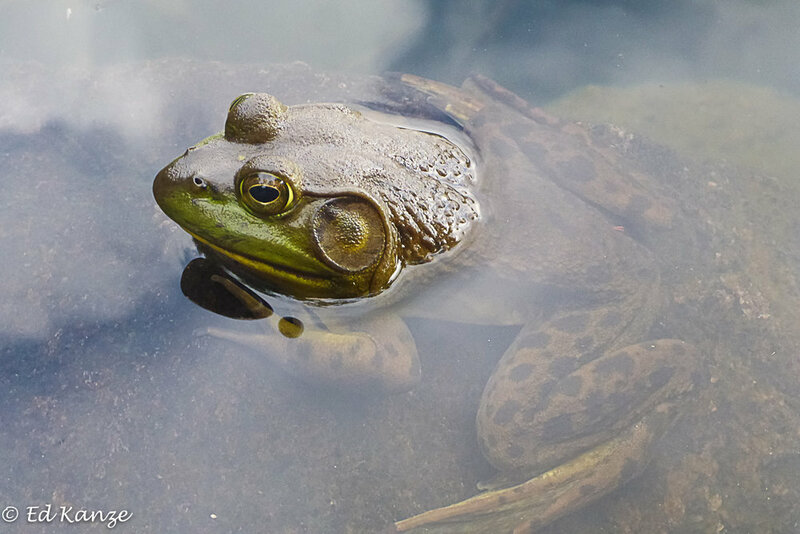 A dramatic thing about the particular bullfrog in the photo immediately above is its ear, the disk-like circle behind its eye. The fact that the ear is much larger than the eye tells us this bullfrog is a male. The green frog shown in the second photo above has an ear not quite the size of the eye. This makes it a female. In breeding season, a male bullfrog speaks in a deep bass voice, saying, Jug-o-rum, Jug-o-rum, Jug-o-rum. Now let's meet the mink frog, a frog of the Far North that ranges south into the cold lakes of the interior Adirondacks. It is named after the member of the weasel family named mink. Mink stink. So do mink frogs if you get really close. It's hard to describe the odor other than to say it's unpleasant and will probably make your nose wrinkle. Sniff one sometime. Let me know what you think. The frog below is a mink frog. As you can see, the mink frog looks something like a green frog. I don't know that I've ever seen a green frog perched on top of a lily pad. As you can see, this mink frog is in just such a place. Most of the Adirondack mink frogs I see are on top of lily pads when I find them. Some mink frogs have a fold of skin running down each side of the back, as green frogs do. Most of the mink frogs I see in the Adirondacks lack these folds. Or, like the individual in the photo above, they have only a hint of them. A clincher for the frog above is that it lacks horizontal bars on the hind legs. It has irregular dark blotches all over its back and all over its legs. A mink frog. This individual, with an ear slightly smaller than the eye, is a female. Males, when they call to a court females and announce their presence to rival males, suggest the beginning of a knock-knock joke. Knock-knock, the mink frog may say. Knock-knock-knock. Of our three green-colored frogs, I find the mink frog the most handsome. Here's another one to admire. One of my favorite photos of a mink frog shows an individual far out on a pond, perched on a lily pad, with a glow of sunset adding a touch of pink to blue water. I'm inclined to title it "Monet, with mink frog." 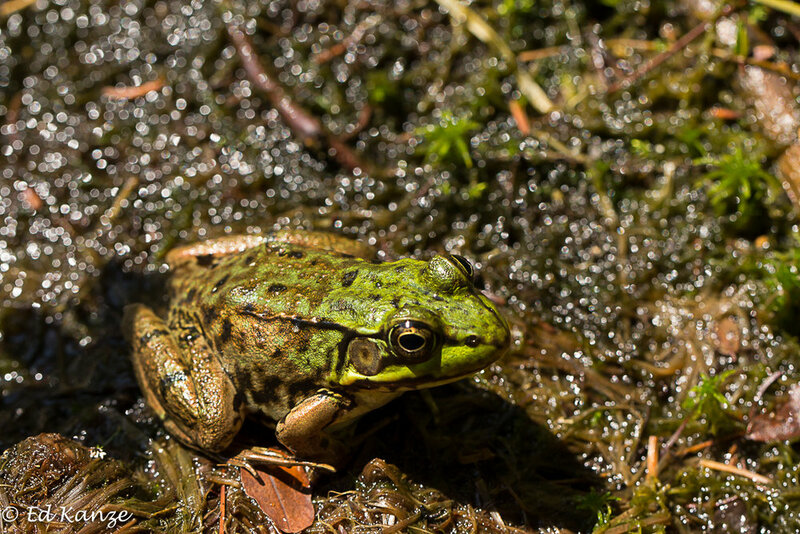 You never know where and when you'll find frogs, but when you do (and we often do on guided trips during late spring, summer, and early fall in the Adirondacks), they're fun and fascinating to meet. The latest molecular evidence suggests frogs, as a group, may have been around for 265 million years. Impressive!